Well here I am, grey, fat and nearly sixty…need a pair of shoelaces tying…no chance…At a 150kg I am making my own clothes and a real age test put me at 10 years older than what I actually am. 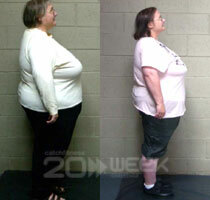 20 Weeks on Kathryn is over 13kgs lighter with a 15 cm smaller waist measurement. “This is the first time I can remember touching my toes” says Kathy having increased her sit and reach flexibility by 25 cm! “Exercise was something I never did…my real age is now 61.1 years only 15 months older than what I actually am, better than the 10 yr difference at the beginning of this competition”.